Ben and I originally planned to go to Italy this year for his 40th birthday and the vacation of a life-time, but once we found out that he was going to be deployed we changed our plans to have a family vacation. When he gets back we'll do another family vacation and then, maybe, the following year we'll do the Italy vacation that we've talked about for so long. But for now, I'm extremely thankful for this family vacation and I'm finally, after 5 months, writing about it! 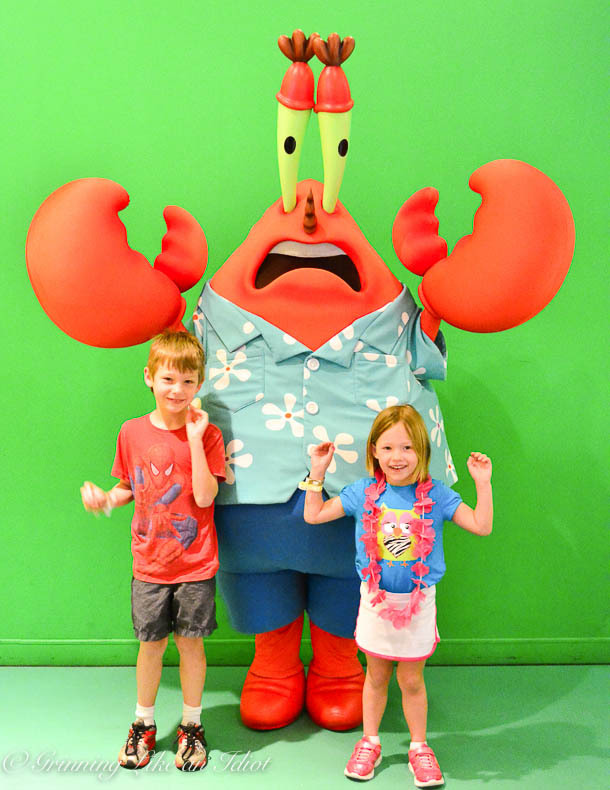 But before we get to the Disney pictures and tales, take a look at the blast we had at the Nickelodeon Resort! 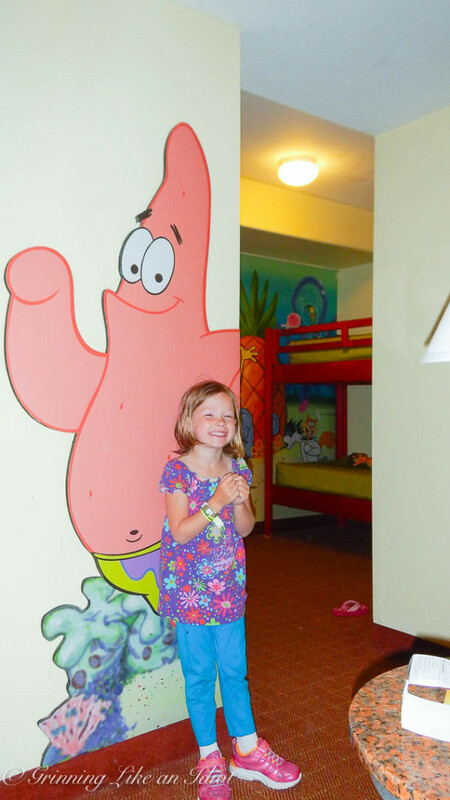 We stayed in a "Spongebob Suite". 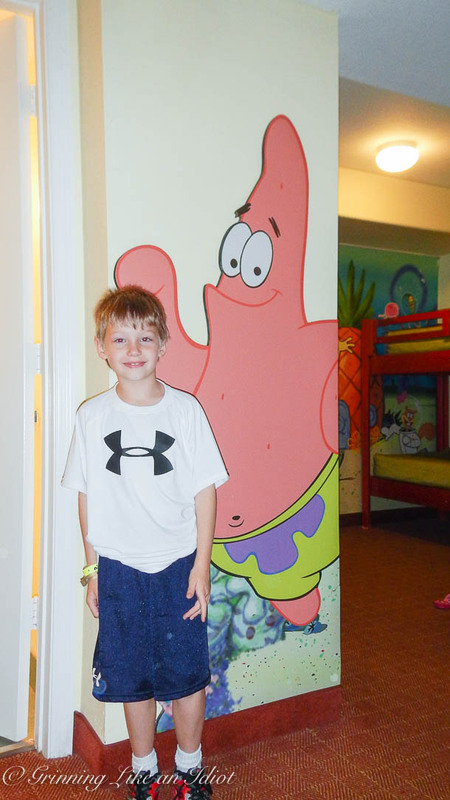 This was the kids room. 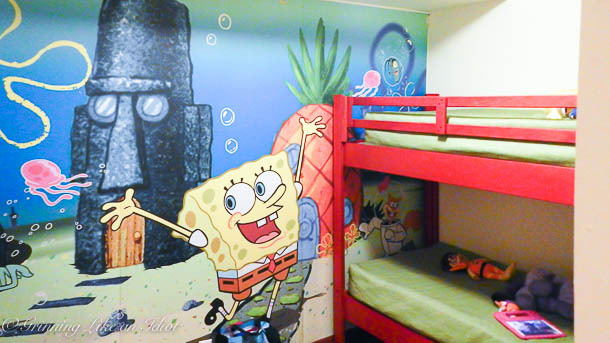 The room had a TV in the room, lights in each bunk bed and no bedroom door. They had rules for certain ages to sleep up on top, so Em slept on the bottom bunk. The living room area had a TV, dining set and bar area with a fridge and microwave (which we stocked from the local Publix with wine, cheese, salomi, crackers, chocolate milk, granola bars, Cheeze-its, cookies etc.). 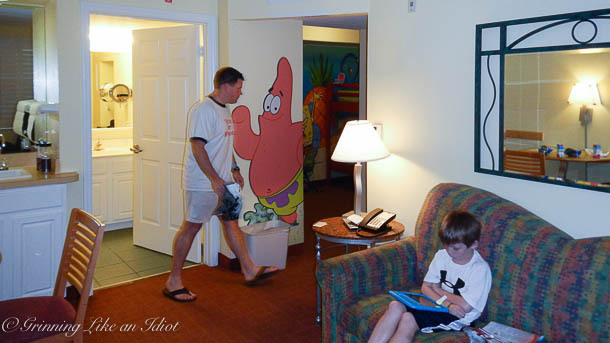 One bathroom, two bedrooms totaling 3 TVs and free wi-fi. 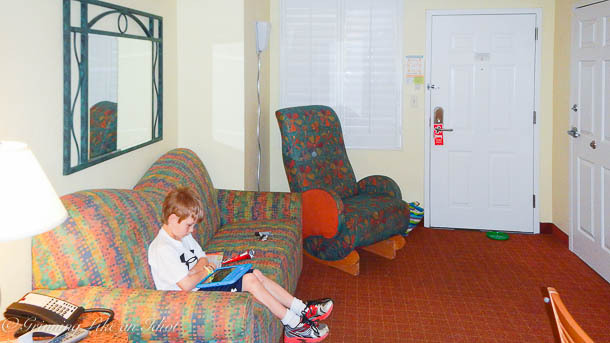 The picture of our room didn't turn out to well, but it was a typical king bed, closet, TV, two bedside tables and a dresser nicely placed and well functioning. 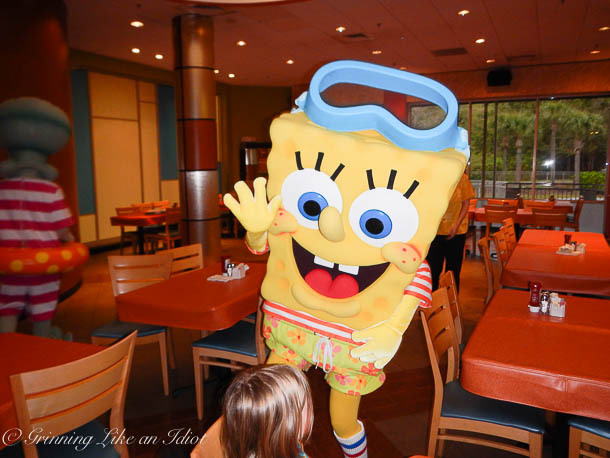 Breakfast with Spongebob at the Bikini Bottom Breakfast! 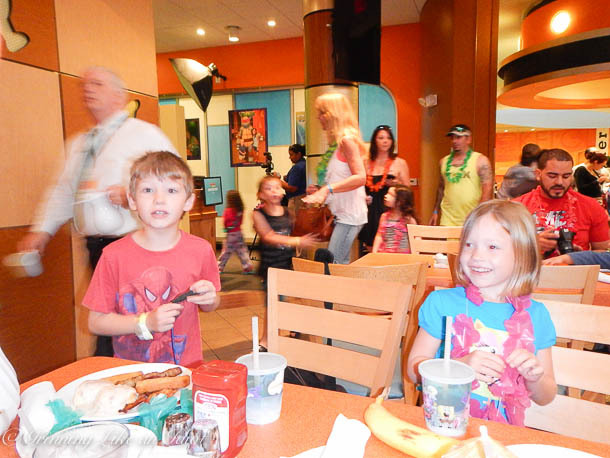 We are early risers, so we were the first ones at breakfast and ALL the characters came running! It was so neat watching the kids faces! 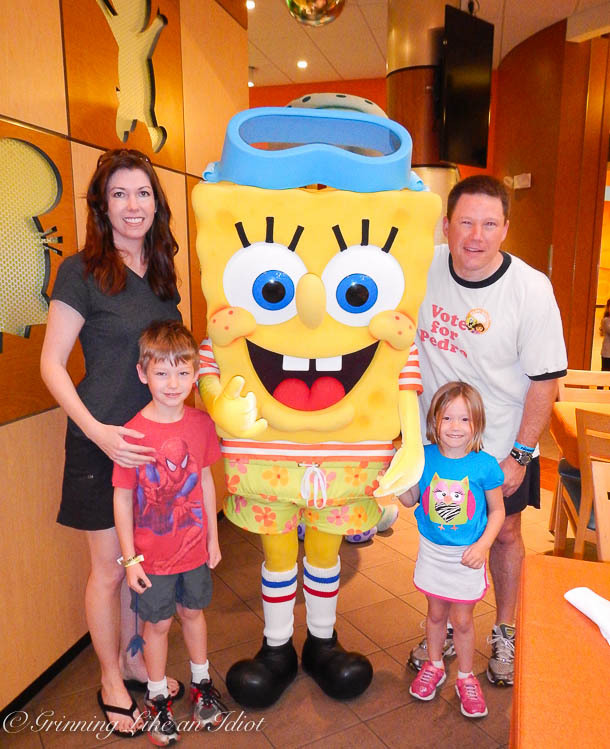 Before we grabbed breakfast we got a family picture with Spongebob!!! 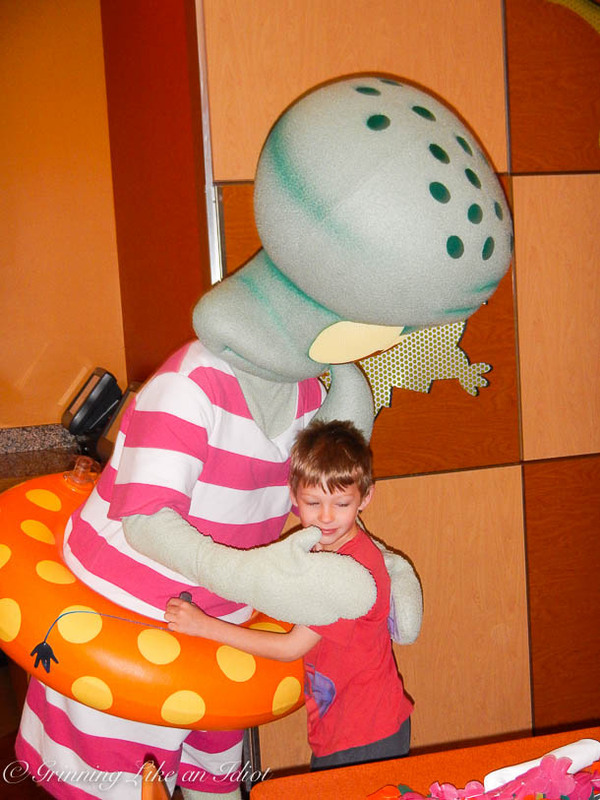 Squidward gave Tyler a big hug! iphone photo turned out a bit grainy...but the smiles are clear! 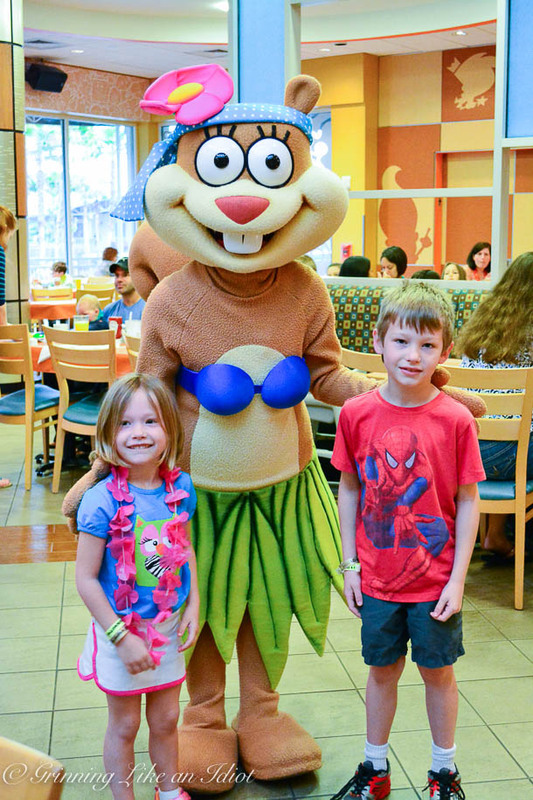 Even Sandy was at the Bikini Bottom Breakfast! (She's Em's favorite). 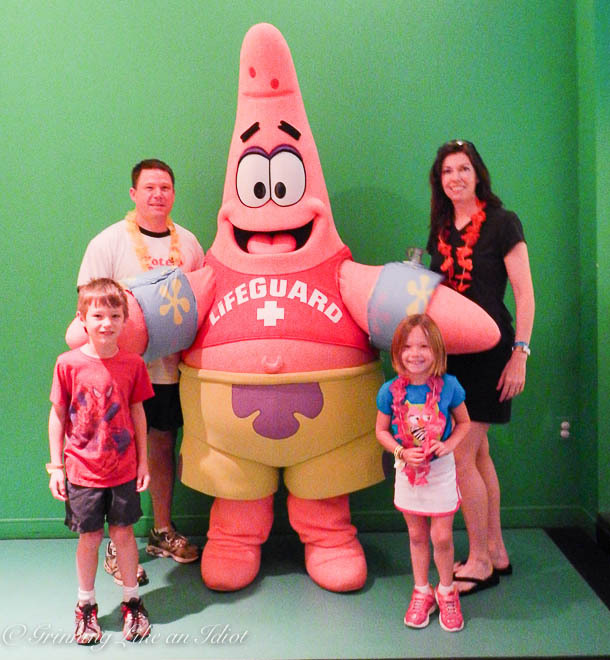 Had to get a picture with Patrick too! Audience participation in the songs and dancing! Ben is such a good sport. :) After this picture I went and grabbed my Nikon because it was so grainy. 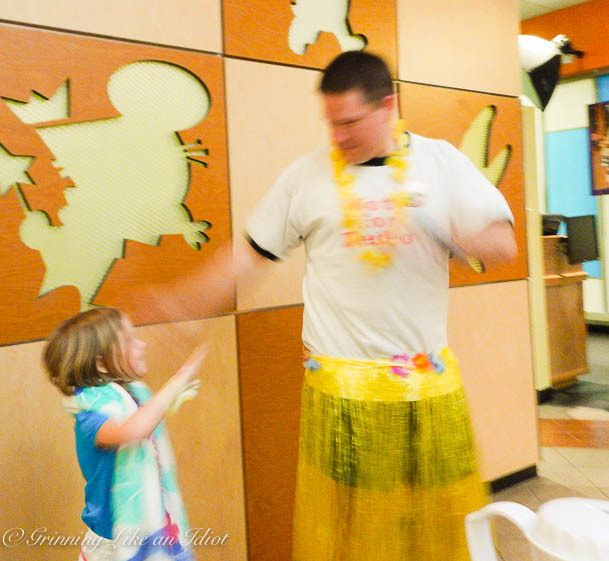 The kids had a blast and we were only at breakfast! Then it was off to one of the two pools! My favorite pool was the one with just the two watersides (which adults can ride too) because it was less crowded, but this trip was not about me, so we spent most of our time at the big pool with the massive water park area! 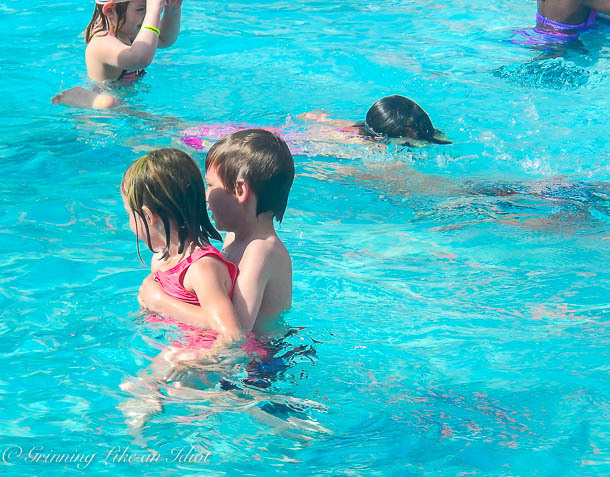 I loved this picture, Tyler helped Em in the deeper areas. They are good kids (when they aren't fighting or competing :)). And that's not the best part of the Nickelodeon Resort, check this out! 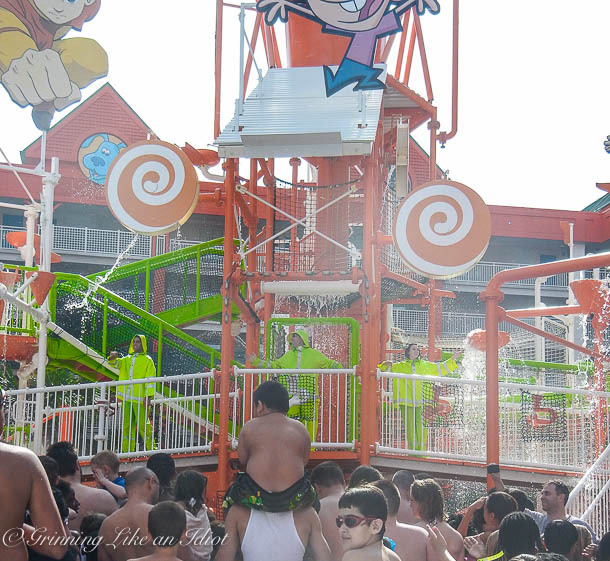 The water-slides and water park area were a ton of fun and kids activities were abundant! Every couple of hours they Resort would have Nickelodeon shows on a stage and pull kids and parents to participate, there were pool side movies at night, (a bar for adults), decorating activities for the kids too! Em decorated an umbrella and a beach bag. If we got tired of the pool, there was also an indoor 4D movie theater and a game room. Every so often (on a schedule), they'd have a HUGE dump of slime onto the knowing people below. Check out this video of the slime dump! One night, Ben and I had a parents night out! The kids played games, ate dinner, watched a movie, and made stuff. Meanwhile, we did nothing, we were exhausted! We ordered pizza, drank some wine and watched movies. In addition, the food was reasonably priced (typical hamburgers, pizza, ice-cream - a kids dream! and Starbucks and Alcohol for the grown-up kids! :) I think it says something that I'm writing this 5 months after our vacation about how much I enjoyed it, even while I'm writing this I'm smiling. 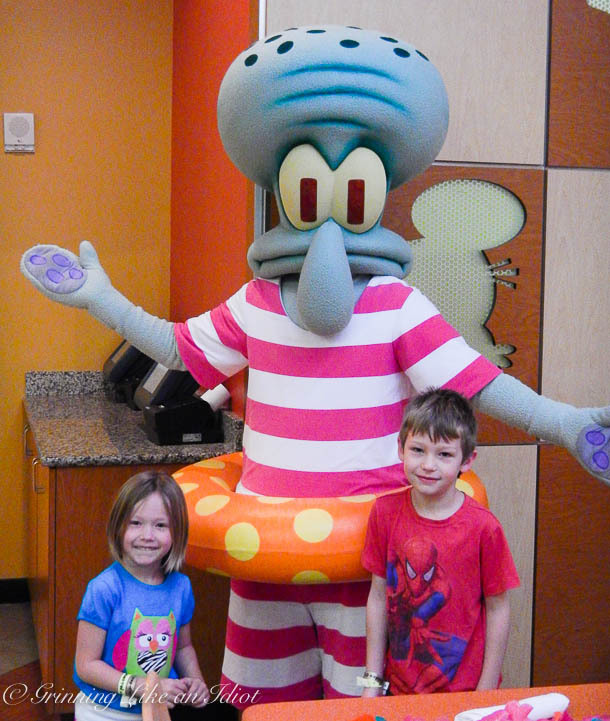 It was a good time and if the kids are still interested (which Spongebob is on almost every day), we'd stay there again!